THY-210B diesel oil purifier series is a new generation based on THY-210A diesel oil purifier. It is designed with electric-heating function in addition to other functions THY-210A series possessed. This new invention is used for filtering more than 90% harmful impurities for diesel engine; guarantee providing more cleaner diesel fuel for your diesel engine, attain the aim of protecting diesel engine and its "Three Filters" and saving oil. This product is different from the existed diesel filter in our market, which can not be installed directly on the diesel engine body. 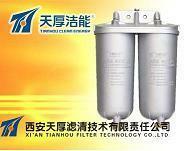 THY-210B diesel oil purifiers should be installed on the oil supply tube between the oil tank and diesel filter. In China, the product has been applied to multiple companies running oil field large equipment, truck, fishery harbors diesel engine, ect, and gained surprising achievements and praise from clients. 1. This product had been promoted in the big oilfields in China, such as Daqing, Dagang, Liaohe, Changqing, Xinjiang, Jiangsu, Huabei, Zhongyuan, Sichuan, Nanyang, etc. 2. A full application had been executed in the coastal fishery harbors in Zhejiang province with substantial support from the local government departments. 3. Large-scale trial use throughout China. 5) Vertically install a new filter core into the case, align the case with the top cap and fasten the binding bolt. Normal operation is allowed only when the air in the system has been expelled.